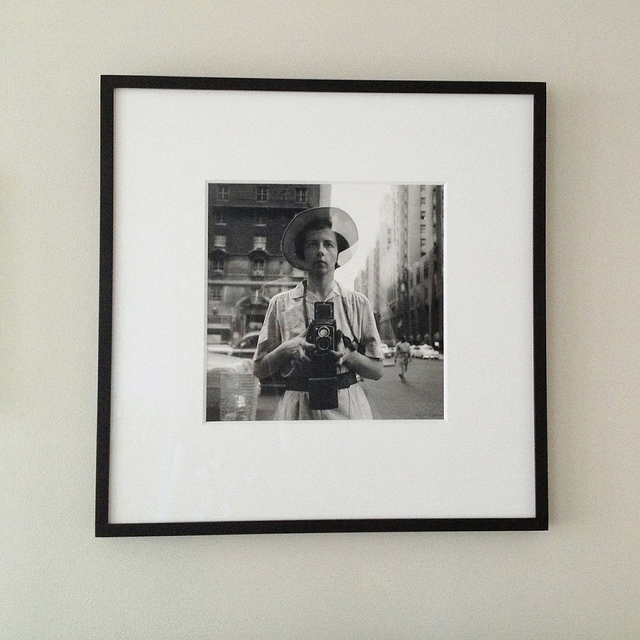 Vivian Maier… A Holiday Giveaway! I hope everyone enjoyed their Christmas holiday. And hey, just because Christmas is over, doesn’t mean there aren’t more gifts to be given! We’ve still got 2 days of giveaways left here at Mortal Muses. By now I am certain you’ve all heard of Vivian Maier. Shortly after her work was discovered in 2007 she became an instant phenomenon in the photography world–most known for her self-portraits and street photos taken in New York City and Chicago in the 1950s-90s with her ever-present Rolleiflex. Vivian was intensely private about her work and left behind a collection of over 100,000 images (negatives, undeveloped film and photos) unbeknownst to her friends and family until they were found and purchased at an auction house in Chicago. On Christmas I am reminded how just a year ago my sweet husband surprised me by purchasing a limited edition print of one of Vivian’s self-portraits as a gift. I was overwhelmed and so excited to become the owner of this amazing piece of art! It now hangs proudly on the wall above our television and as I look at it every day I wonder what kind of person she was like, why she kept her work so secretive, and how she would feel about this posthumous surge of instant fame? 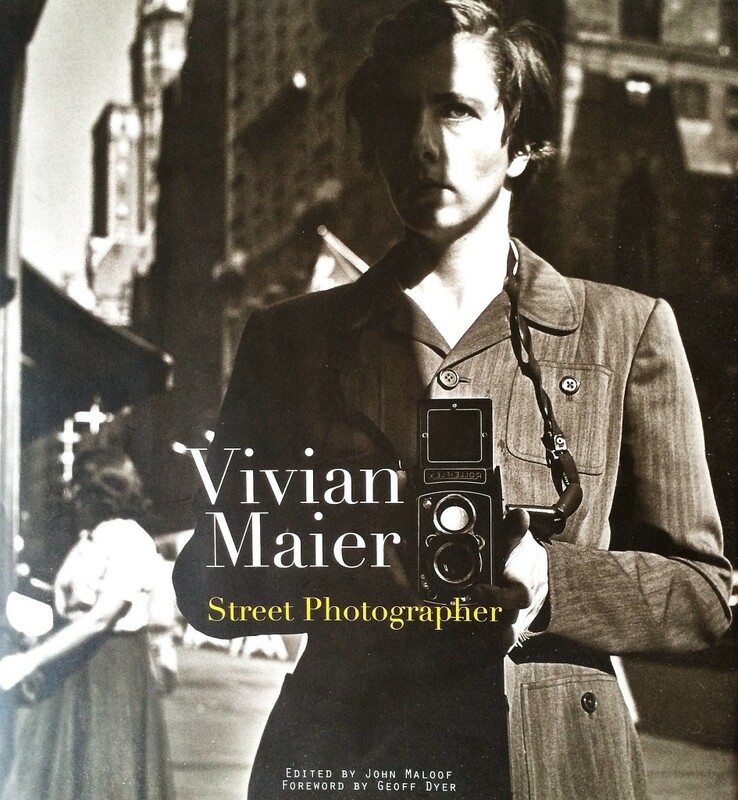 Today’s giveaway is a copy of Vivian Maier: Street Photographer. It is a lovely book edited by John Maloof and a must for any photography book collection. Simply comment on this post for your chance to win (one comment per post, please). It’s not too late to enter any of our holiday giveaways so be sure to check out the other Muses’ posts from the last 10 days or so. All winners will be announced on December 29th. What an absolutely amazing talent. I hope she would be pleased that so many people have been touched by the beauty of her work and herself. Such a fabulous gift your husband gave to you. And I would absolutely love to win this book! Happy holidays, muses! I’ve been following this amazing story and amazing photographer. I’m looking forward to the movie and would LOVE to own this book. Thanks for the chance to win! The story of her life is quite fascinating. Looking forward to seeing the movie when it comes to the theaters. This book looks awesome! I’d love to get my hands on a copy. A wonderful book showcasing an amazing talent. that’s a lovely holiday gift! I really want it! The art historian in me is salivating! Thank you for the chance to win. I marvel at her amazing self portraits. I’m so glad her film was found! This book is on my list! What an amazing talent she was. I always enjoy looking at her photos for inspiration. I’d love to have this book in my library. Vivian was an amazing photographer! Would love this book!! oh please….please 🙂 i would just be in heaven. Who were you Vivian? Really. Ooh! I love her work and have been eying this book for a long time. don’t know her work yet, but the image you posted above is appealing and i can’t take my eyes off it. i’d love to find out more. What a LOVELY giveaway! I love her photos. I saw on NPR article on Vivian and have been fascinated ever since. didn’t know there was a book published! It amazes me that many artistic people never see the appreciation of their work during their lives. Vivian is another. It is also too bad that she had no family to have benefited from her talent. At the same time, the rest of us are fortunate that Vivian’s work was found and work has been done to share it with the world. I got to see her exhibit when it came through Portland and look forward to the release of the film! I have seen some documentaries and am a big fan of hers. I’m SO envious of your print. Having one would be a dream come true. I would LOVE to win the book so I could study her work more. Thanks for the opportunity! This would be amazing to win, thank you for the chance to! Love her work. Sort of the predecessor to Humans of NY without the words. What a fabulous giveaway! Love her work. And that’s so awesome that you have one of her prints. So lucky. This has been on my wish list for quite some time. Fingers crossed! Oh I’m so glad you showcased Vivian here. Many of us can’t wait to see the movie as the trailer just teases you a tad. She was amazing! We would all have a million questions for her if she was with us today….thank you. She is amazing, so glad they found her photos! I love her work. My great grandmother was one of those ‘quiet photographers’ and I recently discovered some of her images my dad gave me. I would love a book! I love her story! I have always hoped that one day after I am long gone someone will find all my photographs, poems, and journals and maybe they will appreciate them. If I don’t win the book you can bet I’ll be buying it! Wonderful giveaway! Thank you for the chance to win! Her street photography is inspiring! This would be awesome. I spent the first 27 years of my life in Chicago. I’d love to see where she shot what she shot. And to think I may have passed her on the street. Interesting selfies. Must go to google to find out more about her! I’m a big fan of her work, so glad that we can enjoy it. I have taken this book out of the library and love it. I would love to win a copy. thank you. I was mesmerized by the discovery of her photography and would love to own this book. THANK YOU! Thank you for introducing me to this woman. I will certainly explore her work. I could tell by her web site that there is a lot to see and learn. What a wonderful gift from your husband! I have not doubt this is a fabulous book. This looks amazing, would love to win! Wonderful holiday gift! I would love to win a copy.Thank you for the chance to win! I would really like to win this book. Vivians photos are wonderful! Oh how I loved the documentary on her! What a fascinating woman and amazing photographer. I live under a rock, apparently. I’ve never heard of her. I’ll have to check out her work. Thanks for the chance to win. christy, i am smitten with your original print of vivian’s! how awesome to have an original of hers in your own home. i hope you had a chance to see the gallery show, if i was any closer to NYC i would have loved to see her work in person. what an interesting woman she was, very inspiring! Christy ~ lucky you, owning that print! What an endearing gift. Vivian’s work is amazing and I’ve been eyeing that book! Wishing you a happy and creative 2014! I wonder what my kids will think when they discover all of my self-portraits of my young and vivacious 20-something self? Sometimes I wonder and marvel myself. I wonderful record to look back on when I am old and grey, at the end of a life. Thanks for the chance. I would love to win this. I enjoy her style of photography. A camera is living proof that we can see through the eyes of another.